You can ReTarget your traffic now, bids starting @ $0.002 CPV for Pops and $0.20 cpm for banners. How to set up re targeting / behaviour targeting for your campaign? insert your website URL for which you want to retarget visitors, and generate code for it, make sure the domain name you insert should match the pixel location. If you put domain name, mydomain.com then pixel should be placed at the home page, mydomain.com/shopping.html, then pixel should be at the shopping page. In General, there will be visitors who leave the websites without a conversion. Re-targeting identifies the users that leave without conversion, targets then to return to your website. 2. Exclude Pixel: You place this pixel on the Thank You page, so that the visitor is not targeted after the conversion. A. When entering a domain, we only need to enter the domain name without the protocols http or https. Example www.abc.com only. 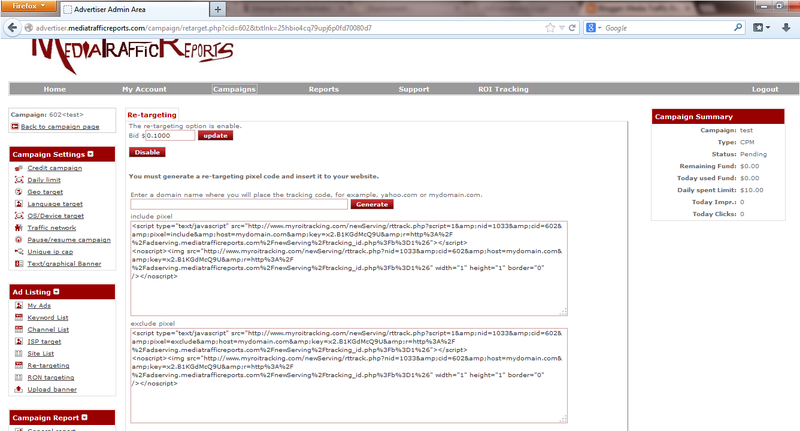 The entered domain has to be the final landing page only(not the redirect or the tracking URL). B. If the landing page is a rotating page, each domain needs to have separate re-targeting pixel. One pixel is only to be used for a specific landing page for which it is generated. C. The generated pixel should be used as it is, without making any manual changes to it. Idea is of re-targeting is to optimize the campaign against specific action or result. and Retargeting takes effect the moment you add pixel, Pixel will not be able to capture visitor which visited website prior to it's placement.